A new resource book about circus will be released in February of 2018 entitled DIY Circus Lab for Kids. 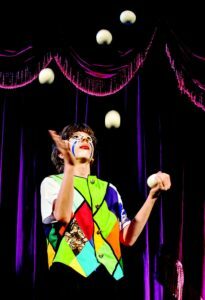 It describes itself as “a family friendly guide for juggling, balancing, clowning and show making.” This book aims to excite youth about the art of circus as well as provide them with the resources they’ll need to experience the transformative power of circus, skill building, and show creation. The author Jackie Leigh Davis‘s circus credentials certainly qualify her to write this valuable resource. She has been teaching circus for over 20 years, is a circademic (a word she herself coined that has caught on in the academic community) and a founding member of the American Youth Circus Organization (AYCO) the first national youth circus advocacy organization in the United States. DIY Circus Lab for Kids is a perfect circus classroom resource and also a tool for children who are interested in learning circus skills but who live in places where there is no access to circus classes. 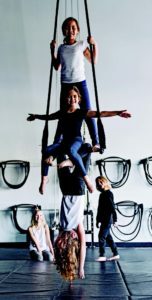 The big question is: can you learn circus safely without an in-person coach to teach technique and catch you before you fall? I will come back to that question, but first let’s talk about the skills the book covers. Learning that a book was written to teach youth challenging physical skills such as partner acrobatics and tightwire had me slightly worried at first–that is until I read it. There has been controversy in the circus world about aerialists learning unsafe practices from photographs or videos online. An image does not show all the intricacies of movement and without an instructor it can be difficult to learn how someone got into that position let alone how they did it safely. But my worries were thankfully set at ease when I looked through DIY Circus Lab and realized that the book was designed to give youth in remote areas access to a taste of circus, not to teach them to do back tucks. Davis provides “SAFETY FIRST!” warnings before any skill that comes a few inches off the earth and explains the necessity of a spotter who is capable of muscling your full body weight. Since 100% safety is not guaranteed even in a circus class with an instructor around, and people learn dangerous skills like skateboarding on their own all the time, it might seem like overkill to be so concerned about safety here, but clearly Davis’s many years of experience working with youth in a circus setting has taught her to prioritize safe practices in order to convey all of the necessary safety cautions. 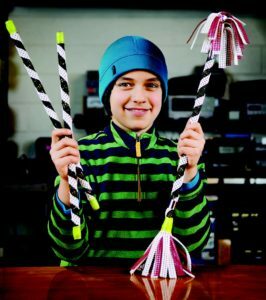 As a resource, DIY Circus Lab for Kids is a well-structured and thought-out one. Not only is the book itself a resource, but it offers a comprehensive list of other circus resources as well. Davis also places great emphasis on the inclusive and DIY nature of circus communities. One of my favorite aspects of the book is that it is a guide for hand making your own props such as a tightrope, rolla bolla, and diabolo. The DIY and circus culture fit perfectly together with this creatively nurturing how-to approach. The book includes a list of youth and social circuses is the USA and the world. 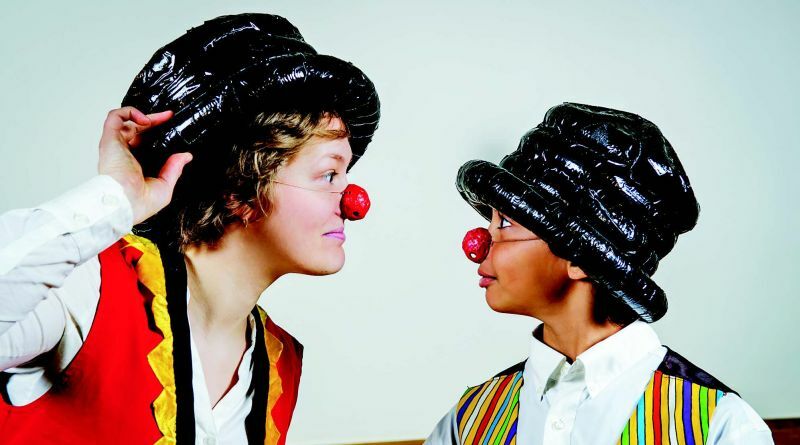 This list encourages youth to seek out face-to-face circus teachers who are likely to become mentors and help shape their circus experience. There is also a resource list full of information like tutorial videos, websites to purchase safe circus equipment, and websites to read up on circus history in specific areas of interest. Along with the book, each young circus student will receive a link to video tutorials which will provide them with a more comprehensive learning tool for physical techniques. 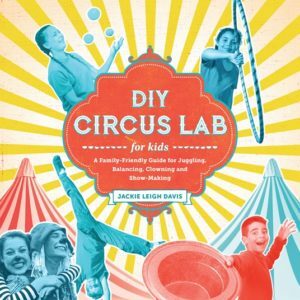 DIY Circus Lab is a great reference book for school libraries and for circus school studio libraries. It’s also a great hands-on gift for adventurous youth, and for video game-obsessed or artistic youth who need to know that not all physical activity is highly competitive or sports based! You can pre-order the book on Amazon for that special young one in your life or wait until February 13th for its official publishing date. As an artist, Fiona Bradley hopes to use circus as a platform to discuss social issues, to create inspiration and to fulfill her own need for connection. Her current home is in Chicago. 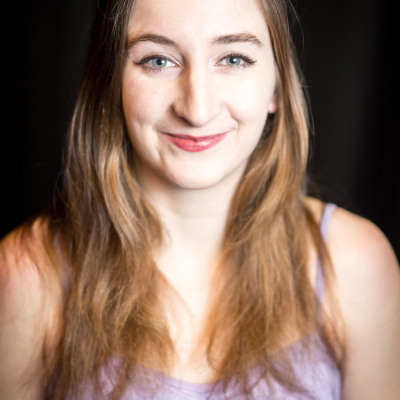 She is the social media and community manager for CircusTalk as well as a founding member of Semi-Circus and ensemble member in Aura Curiatlas. She has received her Certificate IV in Circus Arts from the National Institute of Circus Arts in Australia and continues her education where ever she goes. As well as being a performer, She is interested in circus management. She would like to connect people in the circus world (as well as outside of the circus world) and create an open and empowering community for everyone who is interested! This is one of the reasons she works as the social media and community manager for CircusTalk.